Allan Crawford had a long association with Tristan from 1938 until his death in 2007. He was a founding father and first President of the Tristan da Cunha Association. was the inspiration and driving force behind the formation of the Tristan da Cunha Association, serving as Chairman and Newsletter Editor from 1987-1992. He became the first President in 1992 and Life President in 2003. 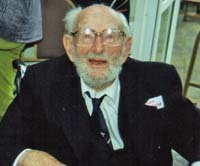 In his nineties Allan still presided over Annual Gatherings and maintained lively contact with members and islanders. Allan drew the first island map following his surveys as the only English member of the 1937/8 Norwegian Expedition - the first scientific expedition to Tristan da Cunha. Allan returned as a meteorologist in 1942/3 with the Royal Navy as they established the top secret Job 9 or HMS Atlantic Isle on Tristan. Allan was valued for his prior knowledge of the island, and during his wartime sojourn he joined a newly formed Island Council, produced the first Tristan Times (costing 3 cigarettes or four potatoes) in 1943. He returned for eighteen months in 1946/7, during which time he designed a set of 10 stamps as part of a petition for postage stamps to be introduced to the island. Only the 1p stamp (also on sale locally for 4 potatoes) was issued and became the pioneer of Tristan philately.In 1954 Allan was appointed Honorary Welfare Officer to Tristan by the British Government. Allan met the evacuated islanders in Cape Town after the 1961 volcanic eruption had forced them to leave their island. Allan was deputy-leader of the Royal Society Expedition to Tristan in early 1962 which reported in detail on the eruption and its effects. It was to Allan that the islanders wrote for help when they became frustrated at lack of progress towards re-settlement whilst in their temporary homes in Calshot near Southampton. Allan formed the Resettlement Survey Expedition of twelve islanders who arrived back on Tristan in September 1962 to prepare a detailed report to decide if the island was fit for habitation. Allan has published five notable books about Tristan da Cunha. His first, I went to Tristan, was published in 1941. 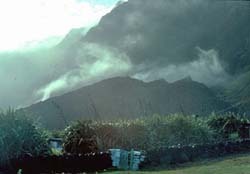 The second, Tristan da Cunha and the Roaring Forties, published in 1982 was the first post-1961 eruption book which provided a comprehensive account of Tristan's history through Allan's experiences. Many islanders have copies of the book signed by Allan on his last Tristan visit in 1984. His next book 'Penguins, Potatoes and Postage Stamps', published in 1999, is richly illustrated and chronicles in detail Allan's associations with the island and his involvement in stamp design in particular. 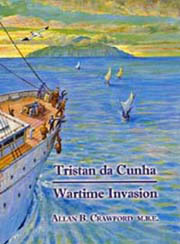 In 2004 Allan's Tristan da Cunha Wartime Invasion concentrated on HMS South Atlantic, again through an expert's eyes. In 2006 he published his memoirs : North, South, East and West to coincide with his intimate connection with Tristan da Cunha over seventy years, and the 500th Anniversary of the island's discovery. See also Books 06/07 and Books 03/05 for details of recent books. Allan was presented with the BEM in 1946 for his World War II service and received the MBE from HM Queen Elizabeth II in March 2002. The Tristan Association was honoured to have such a distinguished patriarch as its Life President.